Those circles with black borders? Empty, every one. 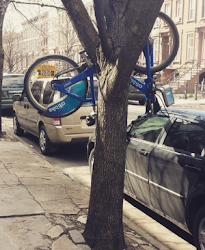 Well folks, here it is: a new Worst Moment for the Citi Bike system. 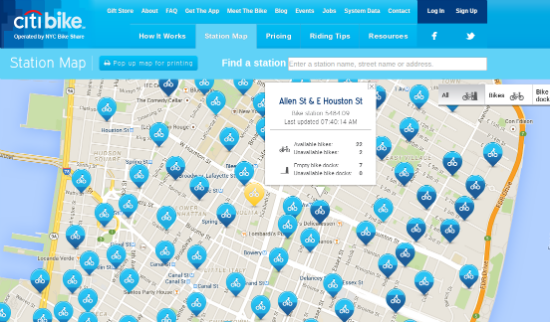 At 9:30 a.m. today 122 stations were empty (108) or full (14). That’s well over one-third of all operating stations(37%). This mark eclipses the previous Worst Moment, set last year on Monday May 27 at 9:30 am. 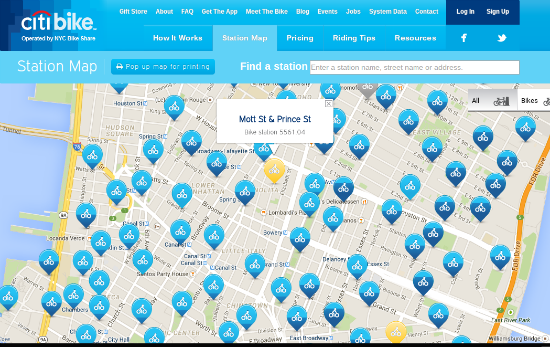 The Citi Bike system is currently experiencing a major station crash with only 174 of 330 stations operating. 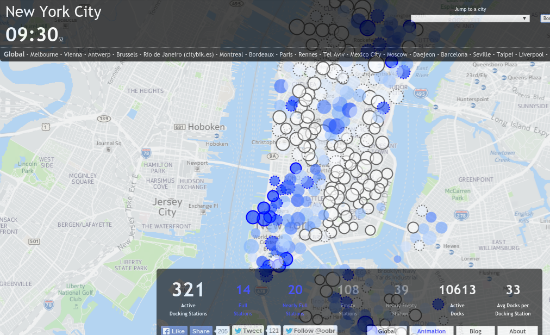 Citi Bike has not yet announced the crash or the reason for it. We'll keep you posted with updates here. Update: A second crash at 10:30. 231 of 330 stations operating. Restored by 11 am. Not nearly enough bikes on the street.That’s our conclusion for the big jump in empty stations during last week’s pleasant weather. This time last year, Citi Bike’s average fleet size was 5700 and bikes in the docks at a given moment on weekdays hovered around 4700. 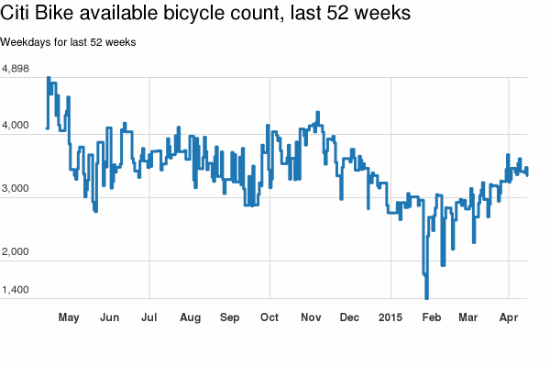 Around noon Friday there were 3460 bikes in the docks -- 1300 fewer than last year. Add this to the mix: membership hit an all-time high of 105,000 last April. The latest available membership figures (February) show a more than 15% decline to around 88,000. So there would seem to be less pressure on the system. And a final reason for our concern. At this writing, 24 mph sustained winds are driving the rain sideways. There are only three empty stations -- an all-time record low. And bikes in the docks stood at 3560. So say there are 400 or so people crazy enough to ride in that stuff. That puts the current fleet size at about 4000, a stunning 30% decline from last April’s average. Maybe last week was just a blip. But for now, 11 straight weeks of satisfactory system performance stands as the record. peaking with 96 NotSpots during the morning rush on May 27. That’s 30 percent of the system. 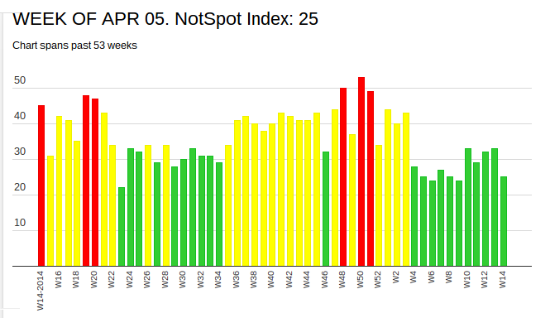 The NotSpot number for last week, 25, extends the unprecendented streak of statisfactory performance to 11 weeks. 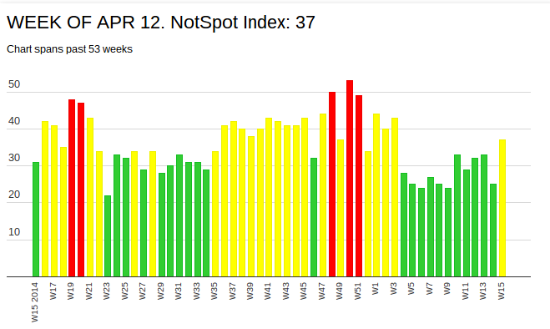 The corresponding week in 2014 came in at an ugly NotSpot 45. The DOT says almost half of the cyclists on this heavily traveled route in TriBeCa are using the sidewalk to avoid the bone-jarring belgian ride. 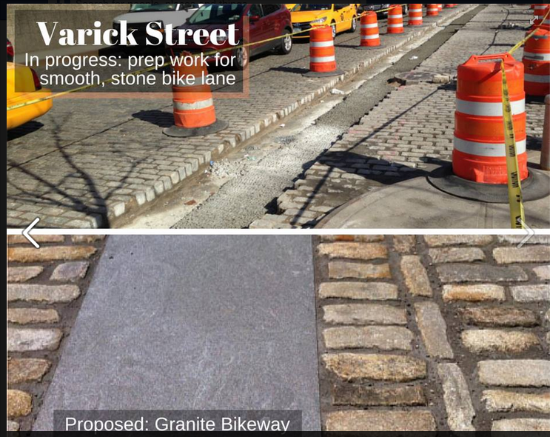 “NYC DOT Sidewalks team completed saw cutting, excavation and laying of the concrete base on Varick St. for our first in-house granite strip that makes a Belgian block street segment smooth for cyclists! One of the frustrating aspects of the Citi Bike experience was arriving at a station and making multiple attempts to take or return a bike before concluding that the whole station was kaput. Now you can avoid those stations. 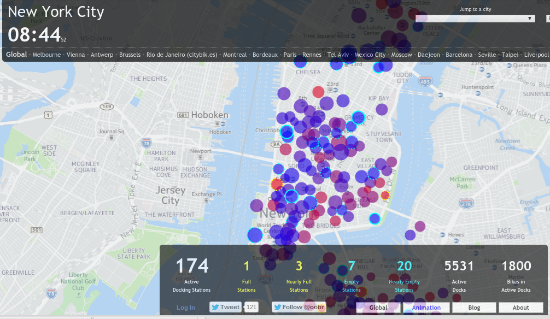 The new software also allows the map to report more info about broken bikes and individual docks that have broken.